When choosing the best container lift system for you, it is important to know how much weight you’ll be lifting. The Horizontal Lift System has both a 10k and 13k lift option. Both are great options, but depending on how much you’ll be lifting, one container lift system might be the better option for you. In this post, we will explore both container lift systems. As stated in its name, the 10k lift can hold 10,000 pounds. A traditional storage container weighs between 2,200 and 2,500 pounds. This means that the customer can have around 7,500 pounds worth of belongings. According to Hunker.com, an average 4-bedroom house has between 7,000 and 10,000 pounds worth of belongings. If a family with a 4-bedroom home is planning on moving all of their items in one move, they may have to go with a portable storage business with a 13k truck as opposed to the 10k truck. If the move is relatively local, a 10k container lift system is still an option because you can take multiple trips. With that being said, there is a big benefit of the 10k container lift system. The 10k container lift system is compatible with a 26,000-pound gross vehicle weight truck. This kind of truck does not require a commercial license CDL. The 13k lift is designed with ISO shipping containers in mind. A 20’ ISO shipping container weighs a great deal more than a traditional storage container, clocking it at about 5000 pounds. When an ISO shipping container is used with the portable lift system, there is a capacity of about 7,500 to 8,000 pounds of content. When a traditional storage container is used with as 13k lift, there is room for 10,500 pounds of content. Which Portable Storage Lift System is Best For Me? What it comes down to is knowing the trends of your area. If you are setting up a portable storage container business in a location with a lot of big houses, or think you’ll be doing a lot of long distance moves, you may want to invest in the 13k lift. If you are thinking of starting a portable storage container business in a location where there are a lot of smaller homes, young families or young adults, the 10k container lift system will work perfectly for you. 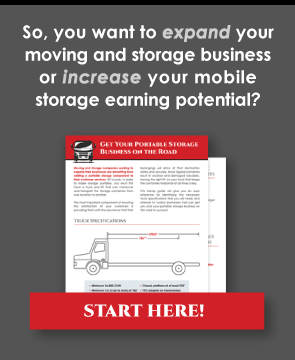 Whether you choose the 10k or 13k storage lift system, feel confident knowing you choose the company that offers the superior lift system in the portable storage industry. Unlike traditional lift systems, the system does not tilt and does not require a special dock in order to be accessed. The system is also compatible with all different sized portable storage containers, so the scope of your business will not be limited by the type of storage container used. Do you have additional questions about the 10k or 13k container lift system? Contact us today!